You are at:Home»Herbs»Curcuma amada Roxb. 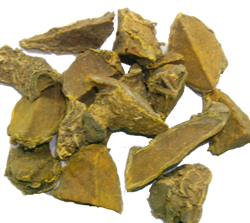 Latin name : Curcuma amada Roxb. Description : The rhizome is antiinflammatory, aromatic, astringent, bitter, blood purifier, carminative, cooling, sedative and stomachic. Used externally as an application for bruises, sprains, pain of the joints, etc. Recommended Dosage : 2 to 4 g powder of dried rhizome. Contraindication : This herb has no known warnings or contraindications when used topically.